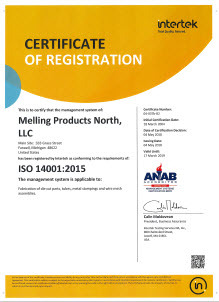 Melling Products North, LLC, a division of Melling Tool since 1981, specializes in the engineering and fabrication of round & rectangular tubular products for customers in several industries. Melling differentiates itself in the industry by having a full service in-house engineering team that can work with you from project start to finish. We can assist you in the design, development, prototype and testing of your tube products. 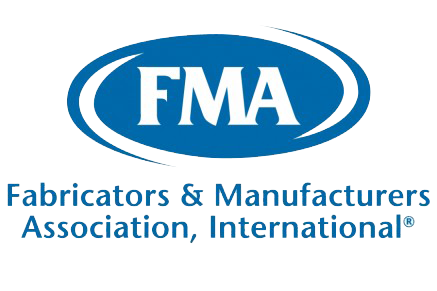 We are a contract manufacturer to both Tier 1 and Tier II suppliers in the Automotive Industry. Contact our Sales team today and let us know how we can assist you with your project. Our services include: tube bending, tube fabrication, tube forming, swedging, forming, beading, piercing, tube welding, and assembly stamping. Melling offers several manufacturing processes for Steel & Aluminum Tubular Products for variety of industries including automotive and industrial applications. Since 1947 we have been processing tubular products and assemblies for both Tier 1 and Tier 2 suppliers. Our facility in Farwell, Michigan is equipped to handle all of your high volume tube fabricating applications. We have over 40 engineers on staff at our other Melling manufacturing facilities that can assist with your product development needs. 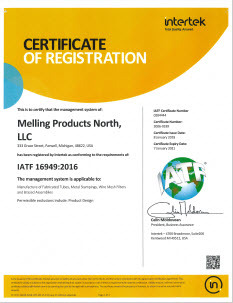 Melling Products North, LLC is located in Farwell, MI is a subsidiary of Melling Tool Company. Manufacturing Capabilities include development, testing, production, assembly, bending of round & rectangular tube plus atmosphere controlled furnace brazing & leak testing. Automated CNC Electric & Hydraulic Tube Bending, Tube Endforming, Flaring, Beading, Tube Cut-off, Progressive Stamping Press, Atmosphere Controlled Furnace Brazing, Leak Testing, & Cleanliness Lab. Tier 1&2 Supplier for Development, Testing, Production, and Assembly of Round and Rectangular Tubular Assemblies, Windshield Wiper Arms, Wire Strainer Assemblies, Welded & Brazed Asseblies plus much more. Our Vacuum Loss Test performs the actual suction function of a pick-up tube. We have the ability to provide you with contamination testing of products manufactured in our facility. We use the patented non-contact laser probe for highly accurate tube, pipe, and wire measurement.